ShowMate is a small, lightweight device to project PowerPoint presentations and screen contents wirelessly from a smartphone. Use the ShowMate to give wireless, real-time demonstrations and training of handheld applications and features. And of course the ShowMate still allows you to project high quality PowerPoint presentations right from your handheld. Connect the pocket-sized ShowMate to a projector or monitor and click on the Impatica Screen Projector application icon on your smartphone. 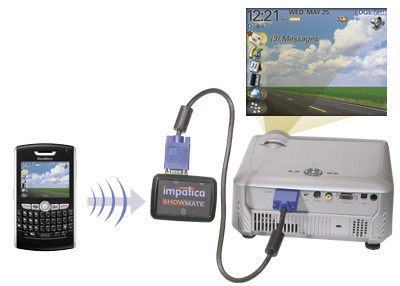 The contents of your handheld screen are then transmitted to the ShowMate via Bluetooth or USB (BlackBerry only) and displayed on any VGA device, without noticeable delay. The screen projection capability is included with ShowMate version 2.3.1 (2.4.0 for newer (e.g Tour) BlackBerry devices)or later for BlackBerry and 2.3.5 or later for Windows Mobile devices. It is compatible with all BlackBerry smartphones running BlackBerry device software 4.2.2 or higher and all Windows Mobile devices with Windows Mobile 5 or later. Note: To project high resolution PowerPoint presentations you must use the Impatica Presentation Viewer application on your handheld. Learn more >>. Show customers, quickly and easily, the benefits of the handheld and its applications. Reduce training time and costs with faster comprehension, higher usage by showing users exactly how to operate their handheld; step-by-step, with no delay. Demonstrate handheld features with customers following along on a LCD monitor or plasma screen. Windows Mobile® Smartphone or Pocket PC with Windows Mobile 5 or later.